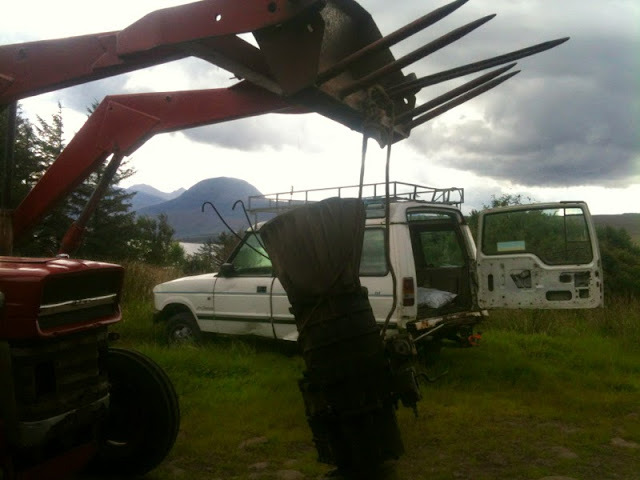 Here on Scoraig, we rely on a 4WD vehicle a lot - to bring supplies up from the jetty, and to move heavy things around. Our Landrover gearbox had totally given up - the Landrover wouldn't keep moving at all without jumping in and out of gear.. We were starting to get tired of pushing wheelbarrow loads of just about everything up and down the track.. The thing about living on Scoraig is that you can't simply drive to a garage to have something repaired - even if you could afford it. A mile of water separates the place from the roads and so vehicle repairs have to be carried out here. There is a great spirit of resourcefulness and no job is too big to be tackled. It was time to do something about the Discovery! 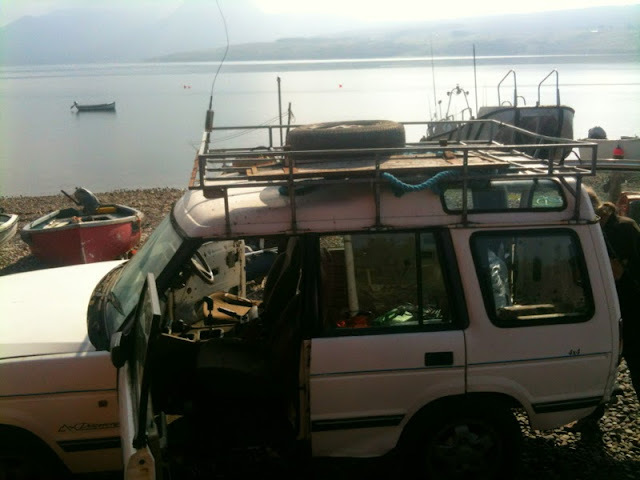 The first step was to locate an old Landrover around the same age and salvage the gearbox from it - then bring it back to the jetty. 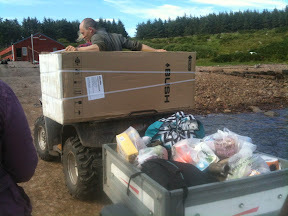 It took three of us to manhandle it down into the boat to bring it across the loch. Since we were crossing, and as is often the case, we loaded up with friends things too.. 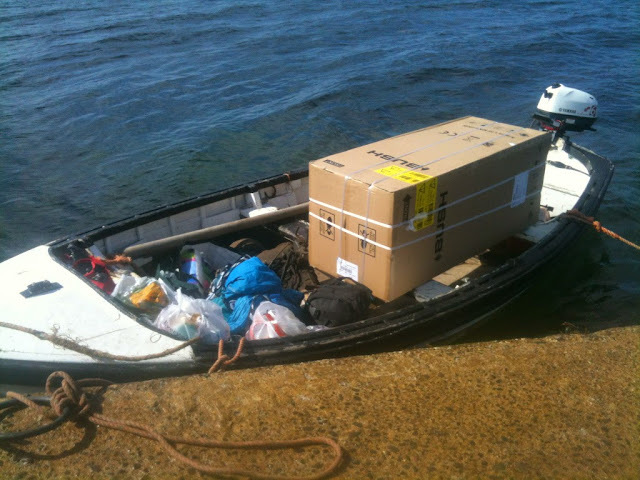 This time we ended up with six people, a dog, a Landrover gearbox, a fridge freezer, and two families groceries and fuel onboard. Crossing the loch was fun, riding the swell, with water lapping close to the gunwales, but the people here are experienced, and things are maybe not as precarious as they might sometimes seem (at least that's what I tell myself). Safely on the other side, everything was loaded into a trailer, and onto the back of a quad bike to be dropped off at various homes along the track. 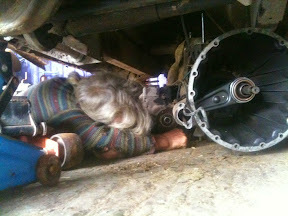 The gearbox is somewhere buried under all the shopping I think.. The day came to begin work on the vehicle. 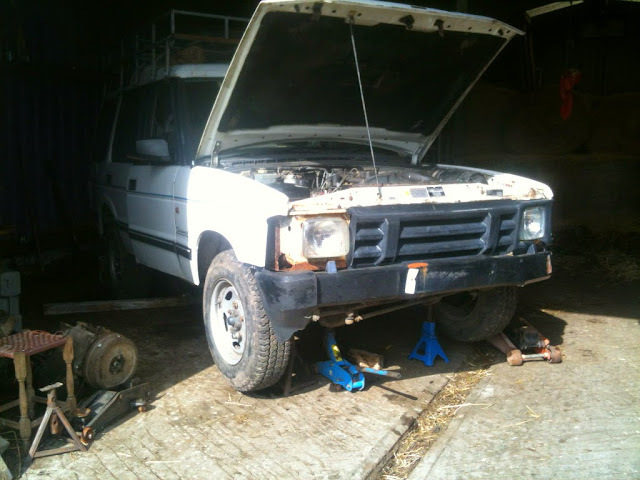 We cleared the shed and swept the floor, and after arranging all the tools for the job, got the Landrover into position to begin work..
We had tools and equipment for the job, but were limited in lifting gear and axle stands to support the vehicle and remove the heavy gearbox. Another opportunity to put our heads together and come up with some sort of solution to the problem.. The solution! A makeshift crane was rigged up to lower the gearbox, while it would be supported form below by a large trolley jack. (I don't recommend this method outside of certain African, or Latin American countries by the way). The question was would the bar hold the weight? The crane and straps fastened to the gearbox before it was unbolted from the engine. 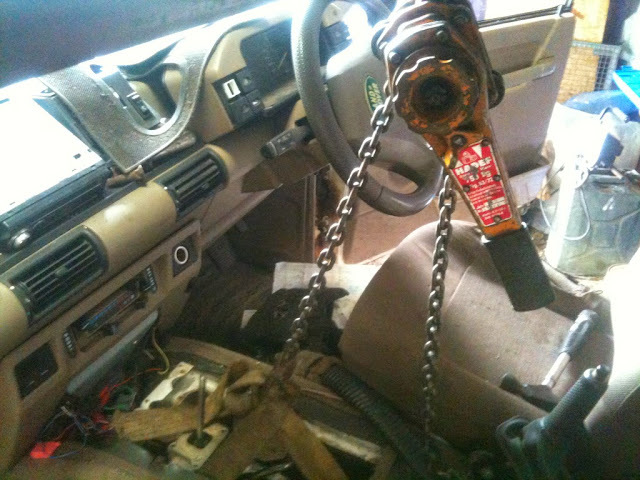 We used a block and tackle to lower the gearbox to the floor.. Finally! The gearbox has been lowered right onto the ground.. We had just enough space to slide it out from below the Landrover to one side. But this was not yet half-way there. 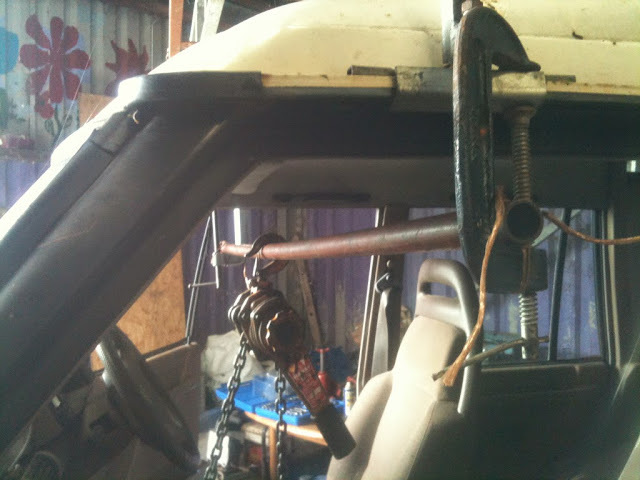 The replacement gearbox would have to be lifted into position, lined up, and the cross-member put into place below it so it would be safely secured. Not an easy proposition swinging on that bar..
Once it had been lifted into place, positioning the new gearbox was not going to be easy with our set-up. 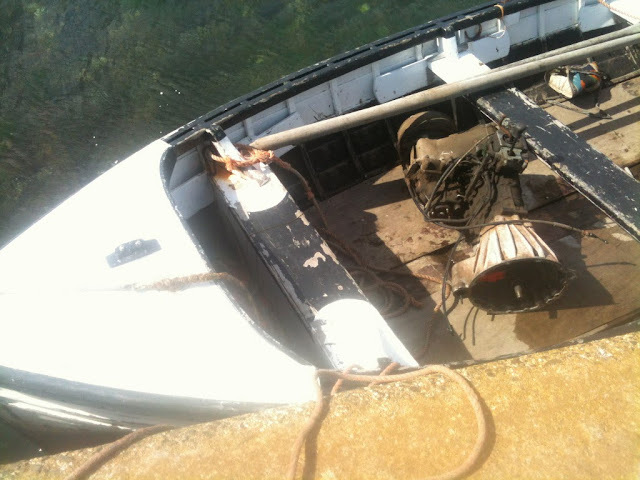 Using various means, including a second block and tackle to pull it forward, we managed to get the studs to line up. 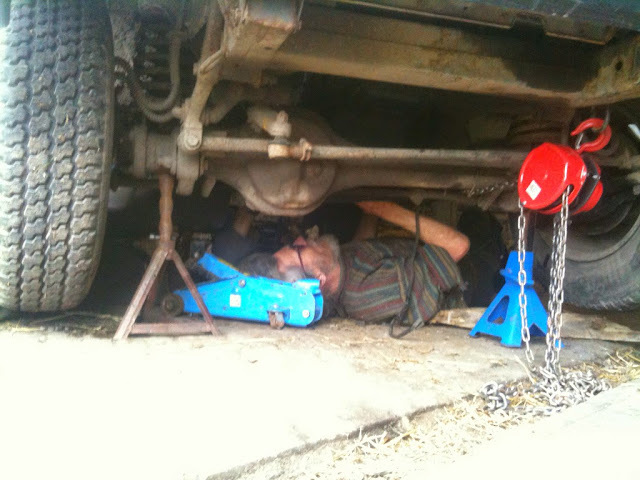 It was a relief once the cross member was in place, securing the gearbox safely from below. It was only afterward that we noticed the bend in the bar! Of course, no one lay under the gearbox when it was unsupported from below. The old gearbox getting taken away.. The Landrover back in action, and back at work, on its test run down to the jetty - we filled it with bags of coal, a load of groceries and lots of tools. 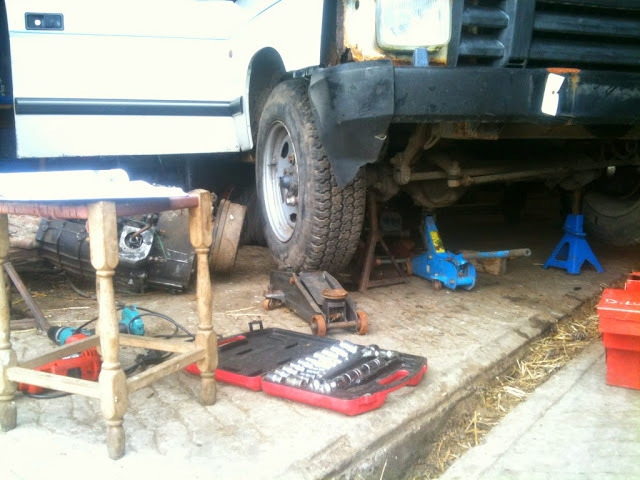 The job was a good one - its running perfectly, so no more wheelbarrowing gas bottles and other heavy stuff around! Another day on Scoraig, another adventure..